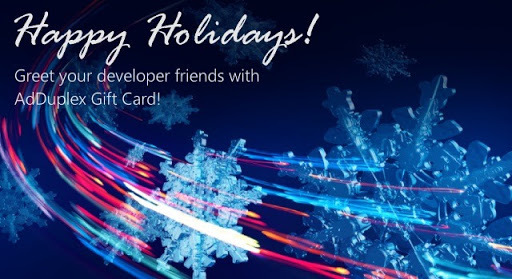 Greet your developer friends with AdDuplex Gift Cards! Holidays are coming! Yes, I know we’ve missed Hanukkah. Sorry about that! $15 coupon that will add $20 and 5,000 run of network impressions to your friend’s account. There are volume discounts on this one too. $100 coupon buys you $200 and 100,000 impression credits. Hopefully this saves you a lot of time and effort and makes your developer friends happy!